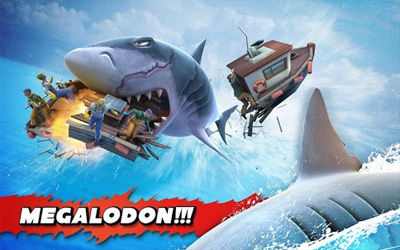 Previous version Hungry Shark Evolution 5.1.0 apk for Android will help you to downgrade or install older app easily. This is one of the best Arcade apps. In this game, your biggest enemy will be the hungry shark. However, sometimes the shark can be you ally as well. There are over 11 different sharks for you to collect and to evolve including the Megalodon shark, Hammerhead shark, and of course the world-famous Great White shark. If the shark is your ally, you can equip the shark of yours with many items and gadget to boost their power. There are also the characters of Baby Sharks that can be used to boost the predatory powers of yours. Playing this game is fun because it has a great console quality. It is completed by 3D graphic, intuitive touch control, and of course tilt control. This game of the year 2013 is available with Facebook social features in which you can tell your friends on Facebook about how well you have done in the Hungry Shark Evolution for Android game. Use Googlecloud saving to synchronise your game across all your Android devices Share your shark videos on social media channels. Tons of bug fixes and tweaks! This game is the most best game i ever played.